Published in the South Kent Gazette, 10 December, 1980. Power had been obtained to construct tramways along several routes. The main line was laid through the whole length of the town, from the South-Eastern Station to Buckland Bridge, but there was trouble from the start with the length of track between The Crosswall and Clarence Place where it crossed the busy railway line to the cross-Channel ferry berths at the Admiralty Pier. The Crosswall level-crossing gates were frequently closed for boat trains and shunting operations and this caused delays on the service. As a result this length of tramway to the South-Eastern Station was soon abandoned. By April, 1898, it had been closed. At the northern end the main line was extended in 1905 through Crabble to River Church. The Folkestone Road branch terminated at Manor Road, Maxton, near the Borough boundary. In opening a tramway system Dover was well ahead of its neighbours. In fact, Dover’s was the first and, for quite a long time, the only electric tramway in the south of England. The official opening was performed by the Mayor, Alderman Henry Minter Baker, who drove the first tramcar (No. 3) from the Town Hall to Buckland, down the town to the Harbour Station and then back to the Town Hall on 6th September, 1987. (A photograph of this tram as it made its way through the Market Square on the inaugural trip appeared in Part 22 of this reprint). On that important first day only one tramcar was in use but the following day there were three operating at 15-minute intervals. This was the most that the Corporation Tramways could manage with only a few trained drivers then available. Before the service could begin there had to be a Board of Trade inspection and this had taken place on 27th August. The Folkestone Road line, not having been completed until November, no trial trip could be made on this route until 1st December, tramcar No. 7 being used. A Board of Trade inspection followed on 10th December. The length of line from the Harbour Station to the South-Eastern Railway Station, via Clarence Place, off Lord Warden Square, did not open until some time In the New Year. The first General Manager of the Tramway was Mr E. C. Carden who held the appointment for over 20 years. Then, for 18 years until 1936 when the tramway closed down, the manager was Mr E. H. Bond. Dover’s early adoption of a tramway system of transport was well received in the press and trade journals. Commending Dover Corporation’s enterprise, Railway World commented that Leeds was "first, Dover second, and the rest nowhere.“ It also took a dig at the city of London: “Why should London wait? Let them ask the Dover council for advice,“ it advised! The system as at first laid down initially was of a total length of 3 miles 6.15 chains, and the 1905 extension to River added more than another mile. The amount of the first outlay was £15,600 for the single lines and passing places, £8,200 for electrical equipment, including the cars; £3,000 for two car sheds and land; and £900 for electric bonding, making a total of £27,700. Subsequently the line was laid double through the wide streets in the central part of the town, and additional cars were purchased to accommodate the increasing traffic. The fares from the beginning were the “popular penny’’ all the way, with halfpenny fares in the early morning and for workmen’s cars. When the line was continued to River, an extra penny was fixed for the extended portion of the route. 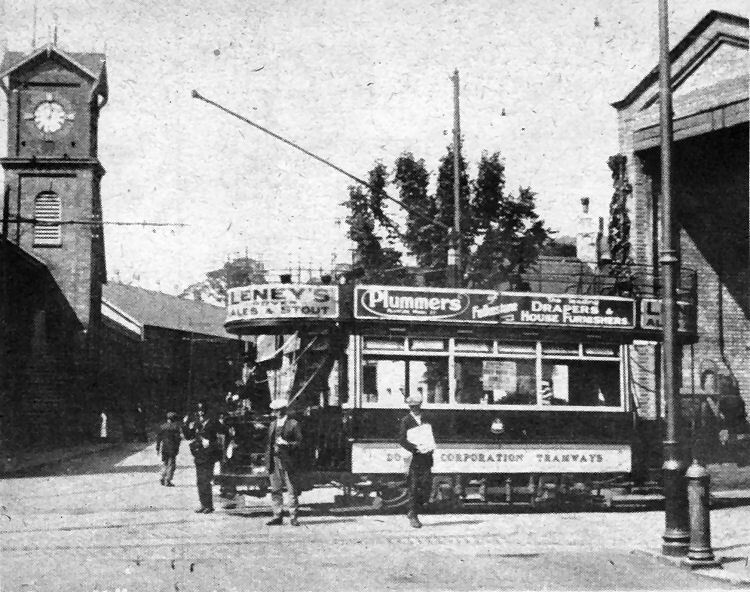 One of the early tramcars outside the Buckland Tram sheds—now Hollis Motors’ car showrooms—with the Buckland Mill clock tower on the left. One of the last tickets to be issued by the tram conductors is pictured above, with the fare stages printed on either side of the centre box. This ticket was punched at the Buckland tram depot. The picture, above, of Cannon Street, depicts one of the four tramcars which were purchased to operate on the River service. Interesting features of this postcard picture, postmarked 1908, include the Rose Inn and E. Rutley Mowll’s wine merchants’ premises—now Courts’ the furnishers—on either side of New Street, Macleod’s Swift cycles and sewing machines shop and Hamilton’s the optician’s above.